"We just never got around to having the wedding, there’s always something else you need, kids clothes, Christmas, car insurance, etc," she said. Sometimes, bad things happen to good people and there’s nothing we can do about it except celebrate the last good days with them. 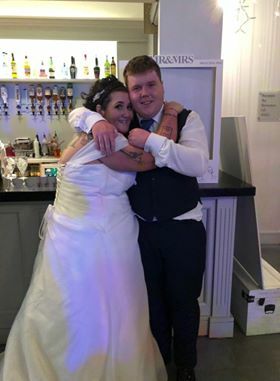 Tina Potts, 40, of Wicklow Town, Ireland found out too late that she had ovarian cancer and the only thing she could do is have the wedding she kept putting off with her partner of 13 years. 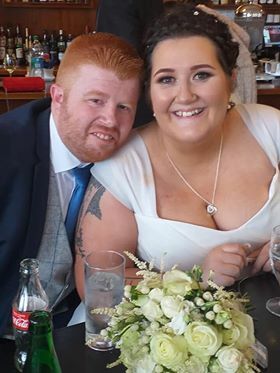 “We just never got around to having it, there’s always something else you need, kids clothes, Christmas, car insurance etc... but I wanted to have a day where we could make some happy memories and that’s what we did!” she told us about her wedding. The mother of two, whose oldest child Philip, 19, has autism, ADHD and dyspraxia, was left devastated when she was diagnosed with cancer in 2017 but the latest blow she received was in January when she was told that she has only 30% chances of being alive till Christmas 2019. Her younger child, Elliott, 11, still doesn’t know that she is dying. Her older son knows the heartbreaking news but she is not sure how much of it he understands. However, the latest bad news spurred her into action. A GoFundMe page was set up to help them conduct the wedding beautifully. Between medical and daily expenses, they couldn’t finance a wedding as well. So the community donated around 10,000 pounds for the wedding, which took place on Daffodil Day. She had been delaying the wedding for more than a decade but the realization that there is no next year made her want the wedding soon since it would be what her partner, Johnny would want too. “We can’t afford to have huge posh wedding but we would love to have a wedding to include the boys before my time is at an end. Tina❤,” she wrote on the page. She had been prioritizing her children over her own wants and had never gotten around to the wedding part. They had been living as man and wife, regardless. And their love was real. 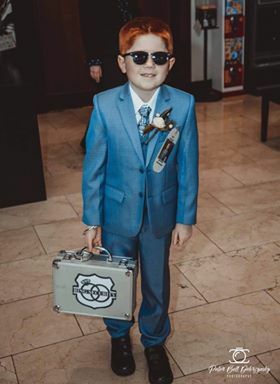 The younger son was the ring bearer at the ceremony while the older was the best man. All she wanted to do was to be a mother and raise well-behaved children. It was an utter shock for her when the diagnosis came in 2017. “It's all I've ever been. That was my goal in life, to rear my children and to have two well behaved, well-mannered children. It's like someone's knocked me down and took it all and then ran away with it,” she said. The mother doesn’t want her children to forget her so she’s preparing memory boxes for them and has been planning her own funeral. Initially, the doctors thought she had constipation. She has hypothyroidism and thought that that was making her tired. “I had back pain but I assumed it was osteoarthritis. But the whole time I had a massive tumor,” she said. When she was finally taken to the Emergency Department with severe pain it was found that she has an 8cm tumor on her ovary. “It was a huge shock – it's bad enough that you're told you have cancer, but to not have anyone there to explain properly the ins and outs of it is doubly scary,” she said. She went through three rounds of chemotherapy and surgery to remove the most part of the tumor in March 2018 but the surgery did not go as planned. She was informed that the cancer was everywhere. They couldn’t remove her womb, spleen or do a retraction on the bowel. But she was determined to fight this and went through more chemotherapy. After months, her tumor marks were at 42, almost normal which is 35, showing that the cancer was subsiding. But it didn’t last. By 2018 Christmas, her tumor marks increased to 1,800. Her doctors said that it was “end game”. By putting her on a new drug in February they wanted to just keep her comfortable over the summer, have a normal Christmas and then it was a waiting game. The brave mother has a message for the women out there. “What I would say to other women is trust your gut, you live in your body and only you can feel what you feel. The doctors only go by what you tell them and they’re not always right. If you have symptoms of ovarian cancer and they’re not going away after a couple of weeks with treatment go back to your doctor and demand a pelvic exam, ultrasound or a ca-125 blood test,” she told us. Accepting her condition has been pretty hard and it’s a long process. “I’m still coming to terms with it, it’s a day by day kinda thing and some days are better than others. Just take it as it comes,” she told us.